NEO Anti - Freeze Coolant has passed the State of California LC50 fresh water fish toxicity and is known to biodegrade in the environment and in sewage systems. 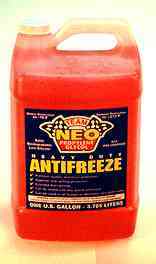 NEO Anti - Freeze Additive is a proprietary blend of all the rust and corrosion inhibitors, detergent, foam inhibitors and lubricant for modern vehicle cooling systems. NEO Anti - Freeze Additive does not contain soluble oil or heavy metals, and it includes an inhibitor to help keep from absorbing heavy metals into the cooling system. It stays in solution, even at boiling temperature. Since it does not gum up, it will keep the thermostat working well. All in all, it will keep the cooling system working at top efficiency. The propylene glycol coolant does not decompose in the engine if the additive package is maintained. Thus, NEO Anti - Freeze Additive and NEO Anti - Freeze Coolant will last indefinitely if the additive is replenished regularly. To switch to NEO Anti - Freeze Coolant, drain the cooling system of as much coolant as practical. Remember that ethylene glycol is a toxic substance and dispose of it as required in your community. Not only is it toxic itself, but used ethylene glycol anti - freeze will undoubtedly contain toxic heavy metals. If the radiator appears clean, refill it with water and run the engine with the heater full on for 30 minutes or more. Then drain the system before it cools. If the cooling system was dirty, add a bottle of the NEO Radiator Cleaner and fill with water. Now run the engine as described above and drain the cooling system before it cools. If it is practical with your vehicle, after the engine has cooled somewhat, leave the radiator drain plug open and start running water from a garden hose into the radiator. After it fills up, start the engine and continue to feed water into the radiator. This will flush the system with water. When you are satisfied that the system is clean, stop the engine and let the radiator drain. Use of a garden hose "backflush" kit is not necessary and not recommended. It is difficult to be sure that all previous coolant was flushed out with this rinsing operation, but any remaining residue will be neutralized by the NEO Anti - Freeze Additive. Likewise, any remaining NEO Radiator Cleaner will also be neutralized. If the radiator tubes are badly blocked they will have to be cleaned (rodded) professionally. Use the same procedures if you are switching to either NEO Anti - Freeze Coolant or water. For passenger car operation in moderate temperatures, use a 50 - 50 mix of water and NEO Anti - Freeze Coolant. The NEO Anti - Freeze Additive package is designed for this concentration of water. If you will be traveling in an area with expected very low temperatures, check the concentration chart vs: temperature on the NEO Anti - Freeze Coolant container and increase the concentration accordingly. For high performance engines, NEO Anti - Freeze Coolant may be used in higher concentration, such as 60 - 40 or 70 - 30 ratios, or higher. However, the cooling system must be monitored carefully for hot spots, which could damage engine parts. The NEO warranty does not apply to this experimental usage.